Today, one of rock’s key iconoclasts celebrates his 71st birthday. Robert Fripp did early work innovating progressive rock at the end of the ‘60s, but has spent the majority of his career working in some strange genre that really isn’t rock, classical, jazz, or anything else. Sure, Robert Fripp’s guitar–based compositions draw from all of these genres, but it is truly a paradigm all his own. King Crimson would reach its highest form with the Discipline trilogy in the early ‘80s, featuring Bill Bruford and Adrian Belew. Next, Joe touches on Fripp’s stint playing guitar for David Bowie toward the end of the ‘70s. Fripp’s playing on Heroes and Scary Monsters (And Super Creeps) may well stand as his crowning achievement as a rock guitarist. Joe takes us through Fripp’s part from “It’s No Game Pt. I” on the latter album. The Bowie collaboration came as a result of Fripp’s fruitful partnership with Brian Eno in the mid–’70s. The two of them would make the sensational contemporary classical album No Pussyfooting together in in 1972, and Fripp would rip an iconic lead on “Baby’s On Fire” from Eno’s 1973 album Here Come the Warm Jets. Fusing 20th century classical music with rock would be a lifelong project of Fripp’s. This led to him develop the New Standard Tuning in 1983, a guitar tuning inspired by all–fifths tunings used for violins and other symphonic string instruments. This is what Joe demonstrates in the final video above. NST is a mellifluous and harmonically rich tuning system that lends itself to unique, beautiful chord voicings. As Joe says in the video, it will really open up a whole Pandora’s box of melodic and harmonic ideas. The tuning starts extra low, with the sixth string tuned to the C below the E used in conventional standard tuning. The issue is that if you tune every string a fifth apart starting at that low C, then the first string on the guitar would need to be tuned to a B. The string tension is simply too great, so the first string has to be tuned to a G.
In fact, your string tension will be radically different from conventional standard tuning, so if you want to play in New Standard Tuning you’ll have to get your guitar set–up for that specifically. If you’re afraid of making the leap, just remember that it’s worked well enough for Robert Fripp all these years. As Joe mentions, he uses a Chase Bliss Brothers for drive and an MXR Carbon Copy for delay in these videos. 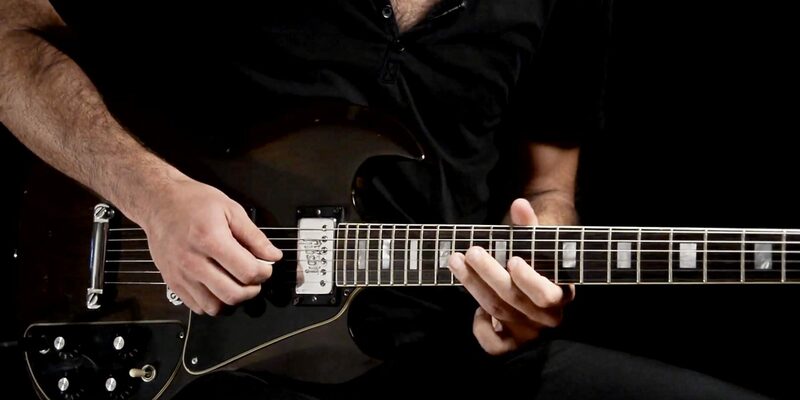 In this video lesson, Joe looks at three meat-and-potatoes Zappa-esque riffs to give just a brief introduction to his varied style.